2008 Thumbs Up! 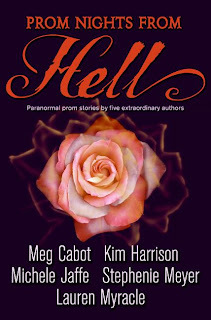 Award: Prom nights from Hell by Meg Cabot, etc..
Prom nights from Hell by Meg Cabot, etc..
What a great fun read! I finished it in one sitting, and it was very light and humorous. Certain tales (Madison Avery and the Dim Reaper) felt like they would make a great novel.. I think this will be very popular, especially with a short story by Stephanie Meyer (not amazing, but entertaining). Yay. Okay, how crazy is this: two books in one year, one titled Prom NIGHTS from Hell and the other Prom DATES from Hell. This one wasn't on our list, so I'll add it. Whoops, another book not on the list.. I guess I just saw the title and thought it looked familiar. I really enjoyed one of the stories- Kiss & Tell by Michelle Jaffe and thought that The Exterminator's Daughter by Meg Cabot was OK, but I had to skip the others because I thought they were just cheesy. I can see how it would appeal to teens girls looking for an easy read, though. The lack of consistency and cheese-factor lead me to give it a NAY. Fun, but not an award winner. Really interesting collection, but not good enough, NAY. Love Meg Cabot, was entertaining but not award worthy. So, nay.